I had the happy opportunity to tour the Maine Mead Works winery this weekend. And no, I didn't drive two hours out of town to some 100-acre tree-lined vineyard. 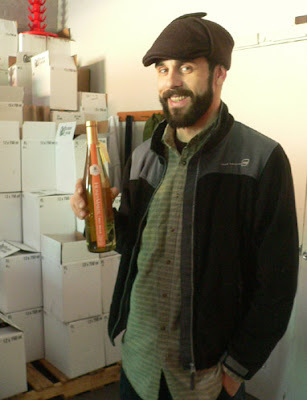 The Maine Mead winery is tucked into a small corner of a Portland warehouse on Anderson Street in Bayside. That's right in our backyard. Mead, you see, is made from honey rather than grapes. And while mead was around long before Jesus made wine out of anything, it's popularity dwindled a few hundred years ago. Luckily, mead makers like Portland's Eli Cayer and Ben Alexander are helping mead get back to its rightful place at our daytime celebrations and late-night confabulations. Two Big Virginia Wine Tasting Coming Right Up! Tasty opportunities in Virginia Beach and Northern Virginia. The Virginia Wine Showcase brings 40 of Virginia's 140-plus wineries together to show off their 2007 vintage. The red wines from that year, generally considered "a very good year" in Virginia thanks to a dry extended growing season, are just now being released. The Feb. 7-8 event in Chantilly, sponsored by the nonprofit association The Farm Wineries Council of Virginia, The Washington Post and Viking Appliances, will offer tastings of more than 300 wines to those attending. Vintners will also be on hand to discuss the different wines. There will also be several seminars each day, including one presented by Mary Schellhammer of Spice Rack Chocolates and another by a representative of Tarara Winery. Those who prefer their wine-tasting closer to home will be able to sample wines from seven of the commonwealth's wineries in Virginia Beach during the Mid-Atlantic Home & Flower Show Feb. 13-15 at the Virginia Beach Convention Center. Among the seven are the two "locals" –– the well-established, award-winning The Williamsburg Winery and one of the state's newest, the 1-year-old New Kent Winery. Here's a really nice, long article about all the great wienries down by the Mason-Dixon line, etc. Some of these are among my favorites. Twin Brook. Va La. Paradox. And the others are nice too! This is a really undervaalued region. Twin Brooks has graduated several winemakers to much larger jobs, including John Graziano at Millbrook. Read it and have fun. Black Walnut. Chaddsford. Dove Valley. Galer Estate. Kreutz Creek. Paradocx. Patone. Penns Woods. Stargazers. Terrapin Station. Twin Brook. Va La. Ten years ago, there were three wineries in the region, and one was floundering. Today, there are 12 properties making wine for sale -- 10 in Chester County across the Pennsylvania line, and two in Cecil County in nearby Maryland, although not all have yet opened shop. And more wineries are on the drawing board. 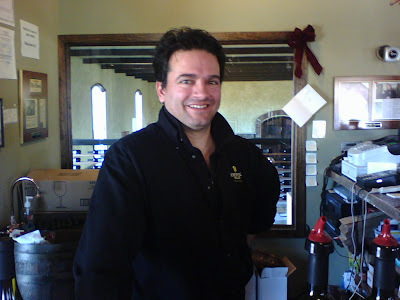 The newest is Mario Patone's Patone Cellars, which made wine this year from purchased grapes and has bought land in West Grove, Pa. to develop as a winery and tasting room. "We hope to have the tasting room open this fall," Patone says, although he has not decided whether to plant the bulk of his grapes in West Grove or elsewhere. 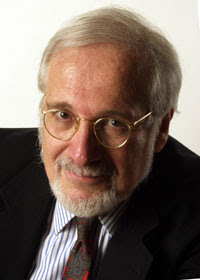 IBM executive Morris Zwick, a graduate of the University of Maryland, established Terrapin Station winery on his wife Janet's family farm just west of Newark in Cecil County, Md. I've been recommending New Jersey wines for years. In the past, however, "good new Jersey wine" usually meant good for New Jersey -- not so good when compared, say, to California or New York State. But as investment in the state's wine industry has ballooned in recent years, pushing the number of commercial wineries above 25, quality has risen dramatically. A good example is this red wine blend from a new winery in Ocean County. Laurita's winemaker is Nick Opdam, who for years crafted some of New Jersey's best wines at the defunct King's Road winery in Warren County. At Laurita, in New Egypt, Opdam has a state-of-the-art winery at his disposal, along with 44 acres of chardonnay, pinot gris, merlot, cabernet sauvignon and other classic grape varieties. It's like it's James Molesworth Day! here at East Coast Wineries. Mr. Molesworth interviews the very well traveled, highly accomplished Johannes Reinhardt of Anthony Road Winery. This is an excellent interview and a coup for Johannes and for Anthony Road. After being sworn into the U.S. Senate Tuesday, Kirsten Gillibrand (D-NY) announced Friday her committee assignments in the chamber. Sen. Gillibrand will serve on the Environment and Public Works Committee, the Senate Agriculture Committee and the Foreign Relations Committee. 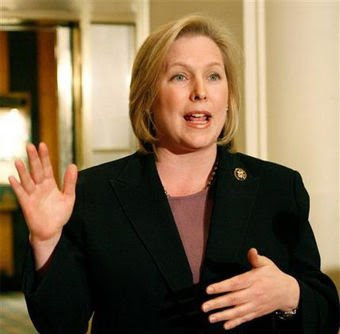 "The Agriculture committee has a little bit for everyone in New York, from funding for low-income families that need food assistance, to programs to support the growing organics markets, to technical assistance and insurance for the vineyards of Long Island and the dairy farms of Western New York," said Senator Kirsten Gillibrand. While 200 people gathered yesterday at the First Universalist Church of Southold to mourn Benjamin Sisson, his work lay in quiet still-life above the rain-packed snow at a Cutchogue vineyard five miles away: stark-black vines protruding from the snow, acres into the foggy distance. Nothing was out of place. Sisson, 49, of Southold, who died Saturday of a sudden illness, was in his element in these fields. An avid outdoorsman who hunted and fished local land and waters while tending fields here for most of his life, Sisson worked as a vineyard manager on the region's most widely known and respected fields of grapes, most recently at McCall Vineyards in Cutchogue. Several well known wineries garnered scores of 85 and higher, again confirming the region's ability to make quality wine that competes with the rest of the country. Lamoreaux Landing, White Springs, and Lakewood came up big! Read the full reviews and other scores of Finger Lake wines in the February 28, 2009 issue of Wine Spectator or join their online subscription. THIS IS HORRENDOUS! THIS IS A SAD SHAME! THIS IS A CRIME! IT IS A CRIME AGAINST NEW YORK STATE WINE, AGAINST AGRICULTURE, AND AGAINST EVERYTHING THE HUDSON VALLEY IS KNOWN AND LOVED FOR! AND IT IS A SHAME THAT SUCH A SAD END SHOULD COME TO SUCH A WELL-LOVED WINERY AND TWO INDIVIDUALS WHO HAVE DONE SO MUCH FOR NEW YORK STATE WINE! 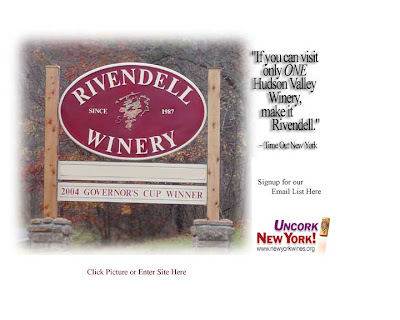 Bob Ransom and Susan Wine were instrumental in helping raise awareness of New York State wine, through their own winery, the founding of wine trails, the new Hudson Valley website, and many other events, meetings, etc. It is a shame the neither local government nor Ransom and Wine could find some solution, even if temporary, to halt this end...especially for two people who have done so much for the greater good. No one won this battle - we all lost. We all lost. ALSO GO TO HUDSON VALLEY WINE GODDESS AND READ HER AS WELL! After almost 10 years of extolling the bounty of New York wines and foods, Vintage New York has closed it's NYC locations. Don't forget to support your local farms. It is the future as well as the past. For the past two years, we have been embroiled in a fight to move our winery to our new property at 507 Albany Post Road - just three miles up the road - closer to New Paltz and the Thruway. Stylish and comfortable, our new tasting room will sport magnificent views of our beloved Shawangunk Ridge and will soon overlook our new vineyard plantings. Unfortunately, there are some in our community who do not believe that a winery is a desireable feature and have in engaged in a campaign of ruthless opposition. After months of public hearings and back-room dealings, the Building Department and the Zoning Board of Appeals of New Paltz delivered a stunning decision: a winery is not an agricultural use and therefore cannot be allowed in an agricultural zone! Though they were supplied with testimonials and recommendations from such experts as the NYS Commissioner of Agriculture, the NY Farm Bureau, the New York Wine & Grape Foundation, numerous attorneys and other wine industry experts - even in light of a recommendation strongly in favor of our proposed use from the Ulster County Planning Board solicited by the Zoning Board - they instead choose to ignore all reasonable interpretations of the definitions of agriculture that have stood the test of time in every other arena in order to re-define agriculture with the express purpose of denying us our constitutional right to use our property as it was zoned. Their logic was based on the mis-interpretation of NYS tax law that makes the land underneath buildings that are utilized for processing, sales or farmowner housing ineligible for an agricultural tax exemption. They extended that tax criteria to mean that those activities taking place in a building on a farm do not qualify as agricultural. BY DOING SO, THEY HAVE MADE VIRTUALLY EVERY FARM IN THE TOWN OF NEW PALTZ A NON-CONFORMING PROPERTY. It is no longer legal according to town law to milk a cow, bake a pie, ferment cheese or even pack apples into a box inside a building! Preposterous! We were left with no choice but to file a lawsuit against the Town to try to get this capricious and anti-agriculture ruling overturned. In a truly horrendous decision, the NYS Supreme Court Judge in the case sided with the Zoning Board putting us now in the position of having to file an appeal. In the meantime, the finacial burden of not only having to carry two properties, but also expend the significant resources to fight the legal battle, all at a time of a worsening economy, has proven to be too much for our 20 year old little company to bear and we have been forced to close our doors. To all of you who have supported our fight, we thank you. And we hope to see you in a tasting room in the future. In the meantime, keep buying and drinking local. It is the future as well as the past. For those who would like to weigh in and voice your opinion, feel free to write a letter to the Editor of the New Paltz Times at newpaltztimes@ulsterpublishing.com, (New Paltz Times, 259 Main Street, New Paltz, NY 12561) or write Toni Hokanson, Supervisor, Town of New Paltz, 1 Veterans Drive, New Paltz, NY 12561. Sugarloaf Mountain Vineyard was conceived with awareness of the unique character of the property, the quality of the soil, and with familial commitment. The double-bank red barn – built in the early 1900s – the silo and windmill are all signature landmarks of the farm. Purchased by Dan and Polly O'Donoghue in 1962, the 92-acre “Windmill Farm” has been a working farm and family retreat ever since. Owned and operated by the four children – the McGarry, McKenna and two O’Donoghue families – the transformation from a traditional farm to a vineyard broke ground in 2002. A wine making team was formed, and soon vines were planted and being nurtured. By 2005, the winery was complete and they were making their first vintages. The award-winning results are worth a taste! Go see SMV to celebrate the gala Grand Opening dedication of the Tasting Room beginning Saturday, January 17 from 11am-6pm and continuing each day all the way through the Presidential Inauguration on January 20th. During their extended 4-day celebration, they’ll feature wine tastings and tours of the winery, sales on selected wines, hot soup, cheese platters, hors d'oeuvres, bottle engraving and entertainment. Among all the Long Island wines I tasted last year, rosés topped my list of most promising. They are becoming a minor staple in the region at a timely moment. Long considered frivolous and beneath serious critique, rosés are booming internationally. The improvements in East End rosés have been striking; today they are being uncorked all year, not just in warm weather. Rosés to try in 2009 are likely to come from Macari, Raphael, Shinn, Martha Clara, Peconic Bay Winery, Roanoke, Waters Crest, Castello di Borghese and Bouké, a new producer. Finger Lakes wineries took four best in class awards, a double gold medal, 11 other gold medals and a slew of others at the 2009 San Francisco Chronicle Wine Competition, which bills itself as the largest competition of American wines in the world. The 2009 professional wine judging took place at the Cloverdale Citrus Fair during the week of Jan. 5. Professional wine judges representing trade, education, media, retail, and restaurants throughout the United States evaluated a record 4,736 wines entered by wineries across the country. Goose Watch Winery collected three best in class awards for its Pinot Noir Brut Rosé ($18), the only New York wine entered in the Sparkling Rosé class; its 2007 Diamond, in the White Native American class; and its 2005 Chambourcin, in the Red Hybrid class. Swedish Hill Winery's 2007 Cayuga White ($9.99) won best in the White Hybrid class. The sparkling wine sweepstakes award went to a New York white wine, Sparkling Pointe's 2000 Brut Seduction from the North Fork of Long Island, which is made according to the Methode Champenoise. That was the only sweepstakes award given to a New York wine; one went to a New Mexico wine and the others all came from California. Swedish Hill is the parent company of Goose Watch and Penguin Bay Winery, which won a rare double gold medal for its 2007 Chambourcin Rosé ($11) in the dry rosé category. Double golds are awarded only when all judges agree the wine deserves a gold medal. "We're definitely happy," said Ian Barry, head winemaker for the three wineries. "... It's especially good to win in San Francisco," likening the California-dominated competition to "being in the lion's den. They're a little more critical (of non-Californian wines), I think." It's a new year and it looks like a promising one for the state's wineries and wine drinkers. Late last year saw the newest entry on the area's wine circuit with the opening of the tasting room at the Black Ankle Vineyards in Mount Airy. Owned by the married couple Sarah O'Herron and Ed Boyce, Black Ankle's first vines were planted in 2003 and its first bottle was produced three years later. The results have been impressive. 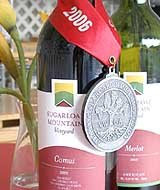 The winery's Crumbling Rock Bordeaux Blend 2006 won the 2008 Governor's Cup Competition sponsored by the Maryland Wine Association. The Governor's Cup goes to the best wine in the state, according to the association. Wine buyers have taken notice, and have been buying lots of Crumbling Rock. "We have probably sold 150 cases. It's been going like crazy," O'Herron said recently. Black Ankle produces 10 different wines — six whites and four reds — all from grapes grown on its 145 acres. 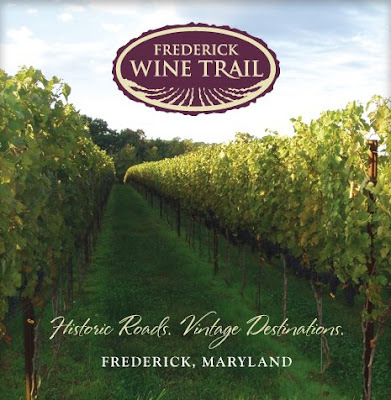 There are several other wineries in the area, with six on the Frederick Wine Trail, including Frederick Wine Cellars in downtown Frederick. Frederick Wine Cellars was also a big winner in the Governor's Cup Competition, snagging a gold medal for its Reisling. The buzz in wine circles this year is not unlike the drama in the Detroit auto industry: staying alive, getting green, upping the quality, creating new models. For wineries outside the West Coast, the place to get a crash course in all these matters is the 33rd annual Wineries Unlimited March 10-13 at the Valley Forge Convention Center in King of Prussia, Pa. It's the largest wine conference and trade show held East of the Rockies, drawing upward of 1,500 attendees, not including exhibitors. And despite the sagging economy, the trade show this year will be bigger than ever, with more than 230 exhibits. While the event is targeted to current and potential grape growers, winemakers and winery owners, it is open to anybody willing to pay admission to learn what wine people are talking about. Wineries Unlimited is a rare a confab of the top vintners around the country, including rising stars, along with esteemed scientists and educators from Cornell, Purdue, Penn State and Virginia Tech. It's time to raise the glasses high for the Seacoast and New Hampshire wine industry! Representatives of both will be doing just that as the fledgling New Hampshire Winery Association (www.nhwineryassociation.com), formed in 2006, participates for the first time as a group in the annual Winter Wine Festival at the Wentworth By the Sea in Newcastle. It's a fifth anniversary celebration that opens Jan. 16 and runs through Feb. 28 with a variety of programming including award-winning winemakers and industry experts and chefs from throughout the nation and world leading Grand Vintner dinners, tastings, educational and entertainment events, music and more. The Winery Association will take part in the gala kick-off Grand Tasting from 7 to 9:30 p.m. Friday, Jan. 16. There will be hundreds of wines and visiting chefs preparing lavish hors d'oeuvres throughout all of the historic hotel's ballrooms. Ben Baldwin and the Big Notes will provide music for dancing in one of the ballrooms and a live duo will perform in the jazz lounge. It is an opportunity to explore the vineyards of the world under one roof, said Michele Duval, Wentworth wine director and executive director of New England Wine Festivals. Happy to share that roof this year are members of the New Hampshire Winery Association said Heather Houle, director of sales, marketing and events at Flag Hill Winery and Distillery in Lee, and a coordinator of the association's participation in the festival. As if it’s not enough of a challenge to grow wine grapes in New Jersey – especially the major European vinifera varieties such as chardonnay and cabernet sauvignon - the determined folks behind Villa Milagro Vineyards, one of our state’s newest wineries, are upping the ante by going organic. In fact, theirs is one of only two organic vineyards on the entire East Coast. Steve Gambino and Audrey Cross-Gambino planted their first grapes in 2003 on a scenic, 104-acre cliff overlooking the Delaware and Musconetcong Rivers in Finesville, not far from Alba Vineyard. Steve, a businessman and former formula racecar driver, is operations manager and Audrey, who was raised in California’s grape-growing Central Valley, is winemaker. “Dr. Audrey,” as she is known, has a Ph.D. in nutrition, is a former television host, and the author of numerous books. She also conducts cooking classes at the winery. 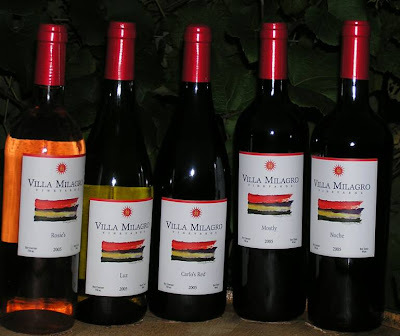 For information about visiting the winery, tasting the wines, and meeting the committed, genial folks who produce them, log on to VillaMilagroVineyards.com. OK, so it was the holidays, and so we spend time with our in-laws. And my father-in-law is Bob Hoover, who lives not so far from our house in Freehold. While were trying to spend some quiet time during the holidays, we decided to call him and see if he wanted to join us for a little dinner one night. Dominique had decided she wanted to make a type of white wine coq a vin, made with Riesling and heavy cream she had found in one of the recent food magazines. My father-in-law arrived wiht his dog, Lulu. As Dominique began making this, the house began to be overwhelmed by the aroma of this dish. We all munched on fresh French brie and a baguette. It was nice to see Bob. We all prattled on about the year in retrospect, and discussed the economy and everything else. We also chatted about family, etc. All the while, the pot of chicken and vegetables, no cooked, went into the oven for the final push, filing the house with more and more tremendous aromas. And with all of this, we decided to try a wine out of the wine cellar. 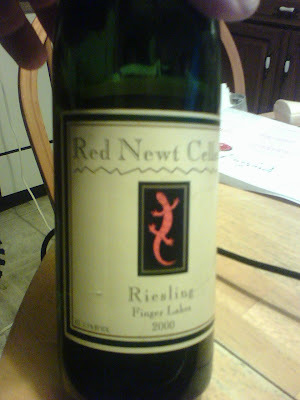 A Red Newt Riesling 2000. Fabulous! It went really well with the aromatic, nay, smelly, brie! And when we finally sat down to eat, devouring the hot, tender chicken, roasted potatoes and carrots, we sopped up the creamy, steamy broth with more french bread, and washed it all down with the bright, fresh Red Newt Cellar wine. It was a nice way to spend the night...the holidays. Red Newt continues to be one of my favorite wineries. They know what they are doing. Congrats to everyone over at Red Newt! 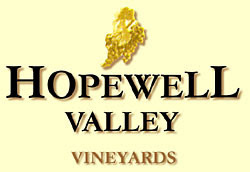 When I first went to Hopewell Valley Vineyards, two or three years ago, it was a single building next to a very large, lovely home, both of which were set against a series of sprawling vineyard blocks. Beautiful. Dominique and I went on a visit. And they have grown! They have a new addition, which is much bigger than the original building, to where the winery is much bigger. The original winemaking room is now a banquet facility of immense size and charm! And the winemaking area is huge, populated by giant stainless steel tanks, a very expensive bladder press. And many state-of-the-art pieces of machinery. But what of the wine? Dom and I were especially interested in their reds, as I had recently heard that, while their Pinot Grigio is especially nice (which is true, since I have had it before), their reds had matured wonderfully. We were greeted cordially by Ando, who had been with the vineyard many years. He welcomed up into the sage colored tastingroom, trimmed in dark wood, field stone, and burnished copper. We tasted many wines, but four really stunned me. First were two dry reds....the Chambourcin 2005 and the Rosso della Valle 2005. These wer both affordable and very, very drinkable. On the Chambourcin the cherry, raspberry, and slight plum come across as promised. It was definitely one of the better Chambourcins I have ever had! And he Rosso della Valle was a blend of Chambourcin and Cabernet Franc. Fabulous! Deep dry red, with great fruit, nice structure, and long finish. Excellent! 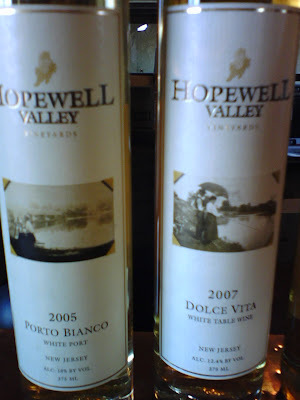 The second two wines I want to rave about are the two dessert whites...Porto Bianco 2005 and Dolce Vita Late Harvest Vidal Blanc. The port smell likes fresh, gourmet, fruitcake. Light, sweet, with touches of pear and apple. Smooth! One of the best white ports I have ever had!!!! The Dolce Vita was lovely. It was fragrant with hints of melon and honeysuckle. And it was smooth. Not too sweet,but balanced and delicate. Very nice! Congrats to the folks at Hopewell Valley! Great stuff! And another great sign of how there are more and more great wines being made in the Garden State! Tried to take some time off during the busy holidays after a very exhausting, but rewarding year. In the last two weeks Dominique and i visitied several wineries. Here the first in a series of stories about some of the wines and wineries we tried. First up is Crossing Vinyards. Between Christmas and New Years, we decided to take a ride over to Crossing Vineyards, at Washington Crossing. We went in a caravan with my parents in one car, Dominique and myslf in another car, and my father-in-law holding up the rear with his dog (his constant travel companion)in the car. Half way across New Jersey suddenly the dashboard of our SUV lit up like Dominique had just hit on a slot machine. Then, before we could pull over the side of he road as the middle car of this caravan, there was a load "Boom!" Then steam and spurting green liquid. In short, the alternator belt had broken, whipped around the inside of the engine a few times, and sliced up the radiator hose. Crap. I volunteered to go with the tow truck, whose drive had assured me I would be back on the road in less than an hour. Instead, I arrived at the gas station on an ice-cold day at 1 o'clock and left at 4 o'clock. I missed the entire family outing at Crossings. I finally got home aorund 5pm. Everyone raved about the tasting room, the property itself, and of course the wines. Everyone loved the barrel room and the vineyards. And of course the wines. Suffice to say I was pissed. But everyone in the family came home with at least one bottle of the Cabernet Franc, among the many other wines. I had been grinding my teeth all day, with no telelvision, no book, no magazines, no radio. As I was poured a glass of wine, I wasn't sure of even a bottle of Cakebread or Turley or Kistler would salve. But the flavors were very nice. The Cabernet Franc was fruity but dry. Nice forward fruit. Classic red structure. Very nice. It didn't make up for a lost and rare day off. But it was a nice way to finish the day. There’s no overstating the importance of receiving a 90 point score from Wine Spectator Magazine. A score that high goes a long way to legitimizing a winery to many professionals, retailers and consumers. New York wines have often been associated with a virtual glass ceiling of 90 points, since scores this high have been rare from major wine publications. Arrowhead Spring Vineyards in Cambria just broke that ceiling when its 2005 Vidal Icewine received 90 points by James Molesworth of Wine Spectator. Their 2006 barrel fermented Chardonnay also received a solid 86 points. 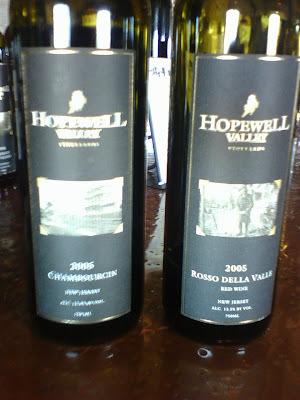 I’ve tasted both of these wines and consider them to be among the best quality wines in the Niagara Region. The chardonnay is well balanced with just enough oak to compliment the zesty fruit. I think this would be an attractive wine for both “naked” and oaked chardonnay fans. 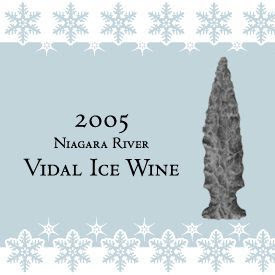 Arrowhead’s Vidal Icewine is a transcendent experience in itself. Jam-packed with too many fruit aromas to list here, it shows a complexity that far exceeds that of more expensive icewines. Since both of these wines were made with purchased fruit, it only heightens my anticipation for Arrowhead’s estate wines. Hopefully these scores will help spread the word that Niagara Region wineries are quietly establishing themselves as serious wine producers that can compete with the very best of other east coast wineries. When you think of the different businesses being opened by entrepreneurs each year, chances are "vintner" would not be at the top on your list. Yet a surprising number of newbies have entered the highly competitive winemaking world, and making a go of it. If going the traditional route, where you buy the land, plant, harvest and bottle yourself, the challenges are immense. Between the cost of the land and harvesting, the capriciousness of Mother Nature and the length of time before the wine is aged and ready to sell--it’s a long shot at best. Even if you buy your grapes from other sources, add in the cost of marketing, a global competition field and a tightly run network of distribution channels, and you can see it's a tricky business. Jason Grizzanti and Jeremy Kidde, both 30, have been friends since the seventh grade. 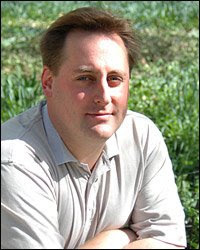 In 2002, Kidde left a banking position at Credit Suisse to work with Grizzanti's father's winery in Warwick, New York--the Warwick Valley Winery & Distillery. With more than 200 wineries in the Hudson Valley, Kidde and Grizzani realized the need to develop a niche. They quickly began developing an American Fruits line of fruit brandies and liqueurs. "The wine industry is so competitive now that it makes it extremely difficult to succeed without doing something unique," says Kidde, whose foray into locally-produced fruit-flavored brandies and ciders has proven to be a winning ticket. In six years the childhood pals have quadrupled sales, and increased employee count from four to 20. Grizzanti is the head winemaker and COO and is currently pursuing his masters in brewing and distillation from the Heriot-Watt University in Scotland. Kidde is the director of sales and the CFO. With their know-how and business skills combined, their wines have won several awards--including a gold medal for the Bartlett Pear Liqueur from the Finger Lakes International Wine Competition, and a silver medal for the Pear Brandy from the Riverside International Wine Competition. "We have the world's largest planting of this vine and are involved in restoration of this really heirloom gem," she says. "I'd rather make the best Norton than the world's 40th best Merlot." This is serial entrepreneur McCloud's 14th business venture. McCloud was in the software business before purchasing her bucolic 412-acre spread that is a hop from downtown Washington, DC. She employs 25 to 40 people each year, and devotes 71-plus acres to produce 15 wines, using grapes that include the indigenous American Norton, as well as the French Viognier. She faced a number of hurdles in her new venture, not the least of which was adjusting to the slower pace of the country life. To get her wine business on a success track required "motivating people to accomplish what's needed to move forward," says McCloud, who believes that the speed with which you can accomplish your goals determines the power of the company. McCloud is also making a positive impact on the environment through "new" agriculture, in a place that used to be a powerhouse of commodity production for Virginia (wheat, corn and dairy). THE FROSTED REPRESENTATION of a golden retriever head on the door. Myriad black-and-white photographs of happy pooches adorning the walls. The jar of dog biscuits on the bar. All signs send a clear message to Keyser, a 6-year-old golden: Dogs are welcome here. But he hasn't entered the lobby of some fancy doggie daycare; he has walked into a winery. Keyser has bellied up the bar (without tasting, of course) in numerous tasting rooms in Virginia, but Barrel Oak in Delaplane may very well be the dog-friendliest of them all. Notice how the initials of Barrel Oak Winery spell "bow," as in "bow-wow"? Yeah, that's not an accident, according to Brian Roeder, who owns the winery with his wife, Sharon. "We were trying to have fun with the name ... thinking of all this stuff," when they had an epiphany: What about Barrel Oak Winery. "[Sharon] went, 'Bow! Bow wow!' And it just worked out." Barrel Oak's dog friendliness — and in some ways, the winery itself — was born out of the couple's desire to keep their two golden retrievers with them during the day. When patrons saw dogs on the property, they wanted to bring their pooches, too. "It was always our intention to be dog-friendly, but we didn't know what that would look like," Brian Roeder said, adding that very, very few have complained about dogs in the tasting room. The very structure of the winery lends itself well to the wear and tear of dogs: The Roeders left the floors unfinished to avoid their being scratched by claws. The tasting bar also features hooks on which to fasten leashes and an off-leash area on Barrel Oak's grounds allows dogs to run freely in the lovely hunt countryside. Brian Roeder noted that Barrel Oak has held dog-centric weekend events, including a "Dog Days of Summer" celebration that brought in 120 dogs and their owners. Through Dec. 21, the winery features the work of Lee Anderson, a photographer whose black-and-white prints of smiling pups adorn the tasting room. "It's been really nice having it on the walls," Brian Roeder said. 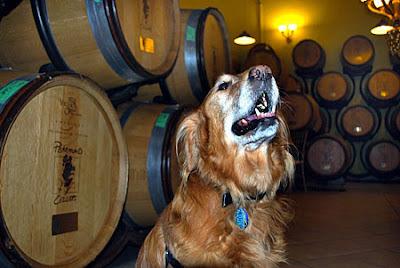 Barrel Oak also donates proceeds from sales of its wine and events to dog-rescue organizations. While Barrel Oak might even qualify as dog-centric, other wineries have happily welcomed Keyser and other well-behaved dogs. At Breaux Vineyards, employees squealed and rushed to pet him when he walked in the door; a patron pointed out the "Wine Dog" book on sale in the gift area. At Three Foxes, Keyser was offered a Milk Bone dog biscuit and received many scratches. He has even visited one of Virginia's top tasting rooms, Barboursville, where a roaring fire and frequent attention made him happy. Dozens of Virginia wineries welcome dogs; a feature on the Virginia Wineries Web site allows sorting by pet-friendly wineries. At Pearmund Cellars in Broad Run, Keyser had to gain the acceptance of Redmund, the owner's Basenji, who even has wines named for him and a little shrine in the gift shop. It was a little tough going, as Redmund on one summer Saturday wasn't too pleased about Keyser's presence, but it all worked out. On a visit on the Sunday after Thanksgiving, however, Redmund relaxed at home with his family, so Keyser was top dog for the moment. But something he smelled outside beckoned him, and he whined throughout most of his owners' tasting. A walk through the barrel room calmed him down, until an object mounted on the wall snared his attention: a stuffed wildebeest head. » Barrel Oak Winery, 3623 Grove Lane, Delaplane, Va.; 540-364-6402. » Breaux Vineyards, 36888 Breaux Vineyards Lane, Purcellville, Va.; 800-492-9961. » Three Foxes, 10100 Three Fox Lane, Delaplane, Va.; 540-364-6073. » Pearmund Cellars Vineyard Winery, 6190 Georgetown Rd., Broad Run, Va.; 540-347-3475. » Barboursville Vineyards, 17655 Winery Rd, Barboursville, Va.; 540-832-3824. I did not know Christian Wollfer personally, but I had many of his wines. While his prices made him somewhat controversial, there is no doubt that Wolffer was a leader in wine on Long Island, who valued his own, an the region's, product, who believed in quality, and who dared to price his wines among the world's best. He put his money where his mouth was. His absence will be sorely felt. Here's part of the news from Newday. Christian Wölffer, owner of Wölffer Estate Vineyard in Sagaponack and a Long Island wine pioneer, was hit and apparently fatally injured by a boat while he was swimming in Brazil on New Year's Eve. Wölffer, 70, was on vacation and a boat's propeller or propellers cut two diagonal wounds in his back while he swimming in Paraty near Rio de Janeiro, according to Brazilian news reports. The O Globo newspaper reported that The Technical Laboratory for Embalmment and Formaldehydization in the Rio suburb of Inhaúma said Friday that his death certificate listed acute anemia caused by internal hemorrhage as the cause of death. The autopsy was performed Thursday by the Forensic Medicine Institute of Angra dos Reis, the largest city in the southern part of the state of Rio de Janeiro. The institute still hasn't made public its official findings. O Globo reported that the Coastal Police in Paraty said Wölffer was swimming at a beach called Saco de Mamanguá when he yelled for help. He was rescued by TV actor Rodrigo Hilbert, who plays the role of a surfer in a soap opera called "Three Sisters." Wölffer was taken to the Hospital Santa Casa de Misericórdia, where he was prounounced dead. Police are investigating. According to the winery Web site, Wölffer, a native of Hamburg, Germany, was fluent in six languages and had business interests from the Far East to South America in banking, venture capital, real estate, agriculture and entertainment parks. In 1978, he purchased Sagpond Farm, a 14-acre parcel with a farmhouse surrounded by potato fields in Sagaponack. He invested more than $15 million in his South Fork winemaking venture, expanding his holdings to more than 170 acres including his 55-acre Wölffer Estate Vineyard on Sagg Road as well as his home, stables, and grazing land for his thoroughbred horses. "He was one of these larger-than-life characters," said Ted Conklin, owner of the American Hotel in Sag Harbor. "He was a great bon vivant. He always seemed to be somewhere between work and having a fabulous time. But he was very down to earth at the same time. He was an important part of the community."